Lelelerele is born from memories of the good and great moments of Elena Sanchez chilhood(Castellón, Spain 1984), its founder. Trained as a designer, joins her passion for things well done and craft. Its beginnings arose through a blog and in 2011, she created Lelelerele, a company that gives life to the most amazing PEEK friends. Behind every one of its parts there are hours and hours of design and development. Lelelerele’s work is intended for those looking for something more than simple stuffed animals or dolls, since each Lelelerele is carefully handmade in Spain and using the best materials (mohair and cotton). 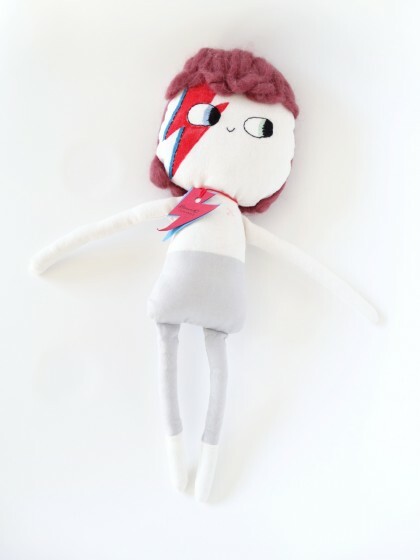 Peek & Pack is a big fan of his eccentric BOWIE, suitable for large and small, and perfect as decor master piece!